Just over a week ago, I took part in a BBC television debate about gross racial abuse. The Daily Mail blogger Abhijit Pandya, argued that even the most vile racial abuse should not be outlawed, arguing, Black people, ‘mustn’t be so sensitive’. When challenged he said that he wouldn’t care if he was called a 'f…Black C….' . Unlike Pandya most people are aware that gross racial abuse is but a short step away from racial violence. One too often follows the other. And that is precisely what occurred earlier this year when the English Defense League supporters hurled racial abuse at shoppers in Chadwell Heath, then chased down and ferociously attacked two Asian men, breaking one man's jaw, although clearly they could have killed him. 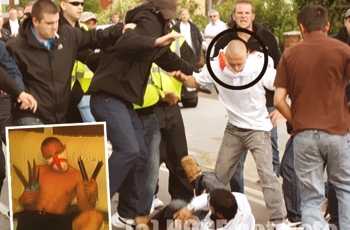 Thankfully at least one person Steven Crispin, a 23-year old EDL member was convicted of this crime, but clearly from the picture EDL supporters behaved like a pack of wolves hunting down their prey. I sincerely hope that Abhijit is never confronted with the level of abuse he says he would not effect him in the slightest because all too often that degree of racial hatred is often accompanied with a punch in the face and or a kick in head. Hats off once more to the brave activist from Hope not Hate. Submitted by Annmarie crispin (not verified) on Wed, 01/08/2012 - 13:17. Steve was convicted of common asult..this is because he put him to the ground to stop Mr baige from hitting another person! It was said that he did not cause injury to Mr baige so he was not convicted of THIS CRIME! If he was he would have been convicted of GBH! Also it was not hope not hate that secured the conviction it was the CPS! Warning to all do not defend anyone being attacked as you will go to prison! Just let them get on with it. Also Steve was not convicted of any racial crime! Or ever even charged with a racial crime.. Intact no racial intent was ever mentioned. This article is a silly way to try to give hope not hate credit for taking a man away from his family.. Well done!